A constitutional lawyer, Mike Ozekhome (SAN) has described the suspension of Justice Walter Onnoghen as totally illegal and unconstitutional. Ozekhome in a statement on Friday he said the provisions of the constitution on appointment and removal of the Chief Justice of Nigeria (CJN) was clear and was not followed by President Muhammadu Buhari. 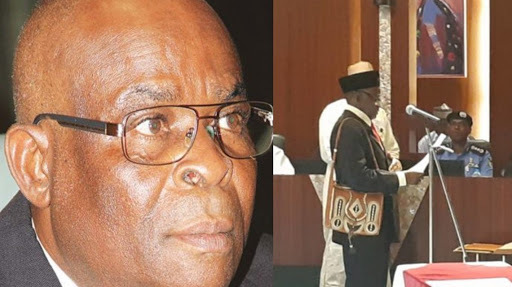 “The provisions of section 292(2) of the 1999 Constitution are quite clear on how the CJN can be removed from office. Aside sections 153,158 and parts 1 and 2 of the 3rd schedule to the Constitution, which provide that a judicial officer can not be removed from office until he has first been tried and dealt with by the National Judicial Council (NJC), Section 292(2) makes it clear that the president can only remove the CJN from office before the age of his retirement when 'acting on an address supported by two-thirds majority of the Senate'. When did the Senate meet to donate this power to the president?” Ozekhome asked. He said Nigerians “should brace up, come out enmasse, to protest against this illegality." He also said Nigerian lawyers and the NBA (Nigeria Bar Association) should shut down all courts in the country until the CJN is returned to his seat. He said this was achieved even under military dictatorship in Pakistan, when former Pakistani president, Pervez Musharraf illegally removed from office the then Chief Justice of Pakistan, Justice Iftikhar Mohammad Chaudhry on 11th March, 2007. “All the lawyers went on strike, from 15th March, 2007, shut down the courts and protested on the streets for months, until a panel of 7 members of the Supreme Court sat and held that the removal was illegal and reinstated the Chief Justice." He said the “NASS (National Assembly) should also shut down in protest."